A South African study visa (formerly known as a study permit) allows a foreign national to reside in the Republic whilst studying at a South African institution of primary, secondary or tertiary education. A study vias can cover a range of educational disciplines and even include practical training as well as internships pertaining to the field of study in some cases. South Africa has a range of internationally recognised tertiary education facilities as well as being a popular destination for foreigners to learn and improve their english as well as a reasonable cost of living for students. Making it a popular destination for many foreigners looking to study aboard. Who is a Study visa for? Which learning institutions qualify students for study visas? To study in South Africa, the applicant must be accepted (or provisionally accepted) to study at the school concerned. Acceptance is proven by way of a letter of acceptance which must be on the school’s letterhead and signed by or on behalf of the registrar or principal. It must notify the Department of Home Affairs if the student completes his or her studies or wishes to extend the period of study at the institution. The applicant must prove that he or she has access to the funds necessary to sustain him or herself for the duration of the course while studying in South Africa. What are the financial requirements for a study visa? The applicant must be covered by South African medical aid for the duration of the studies. Some high commissions abroad will accept foreign medical aid and travel insurance policies in lieu of South African medical aid, but this is the exception rather than the rule. What are the recognized medical aid schemes? Study visa renewal applications must be made at least 60 days prior to the visa expiry date. Who does not qualify for a study visa? If the institution concerned is not a recognised “learning institution” insofar as the Department of Home Affairs is concerned then the applicant will not qualify. To qualify as a “learning institution”, the school must be registered with either the Department of Basic Education or the Department of Higher Education. Examples of institutions whose students may not qualify for a study visa are private language schools, game ranger schools (also called “bush schools”) and institutions which only offer short-term technical courses. Applicants should request proof of registration with the applicable industry body from the institution concerned. Always seek advice from an immigration attorney when in doubt. List of deregistered and bogus learning institutions. A study visa can be issued for the duration of the applicant’s studies at the learning institution concerned. If the applicant changes schools, then a new study visa must be applied for. Although study visas are issued for the duration of study, a maximum period of 8 years for primary school education and 6 years for secondary school education applies. In respect of tertiary education, the duration of the visa is only limited by the duration of the degree, diploma or certificate concerned. There is no limit on the number of times a study visa can be renewed. The identity of both parents must be proven. Both parents must consent to the child’s travel to, and study in, South Africa. If the parents are divorced, or if any one of the parents are predeceased or if the applicant is not in the care of his or her biological parents, then the decree of divorce, death certificate, or court order granting full parental responsibilities (as the case may be) will be required. It must be proven that the child will have a guardian in South Africa. The guardian must be proven to be willing and able to act as guardian and must prove his or her physical address and contact details. A police clearance certificate is not required in respect of applicants under the age of 18 years. Children under 12 do not need to submit radiological reports. The study visa holders are permitted to work, but only for a maximum of 20 hours per week and only if studying at tertiary level. If the applicant needs the authority to work more hours per week, then a work visa should be applied for. Change of status applications may be made from within South Africa. Study visa holders may not run a business. The holder of a study visa may only attend class at the learning institution for which the visa was issued. If the visa holder changes schools, a new study visa must be applied for. The processing time for a study visa application submitted in South Africa is between 4 and 8 weeks. The processing time for a study visa application submitted at a foreign mission abroad varies greatly depending on the high commission concerned and the time of the year. Applications submitted at the High Commission in Brussels have been approved in as little as 3 days, while applications submitted at South Africa House in London generally take around 5 weeks. The most common reason for delays in visa applications is incomplete and missing documents. It is not the Department of Home Affairs’ mandate to cure applications or to advise on applications. Rightly or wrongly, the Department of Home Affairs only considers the application based on what has been submitted. Contact us to ensure that your application is correct and approved as quickly as possible. R3 000 x 12 = R36 000. Can my family members accompany me on my study visa? Yes. The study visa holder’s spouse and dependent children may apply for accompanying spouse or child visas. These visas can be issued for up to three years, but the accompanying family members may not run a business, work or study. The parents, grandparents, brothers and sisters of a study visa holder do not qualify for accompanying family member visas. Accompanying spouses and children cannot change their status from within South Africa. Change of status applications must be made from the applicant’s country of ordinary residence. 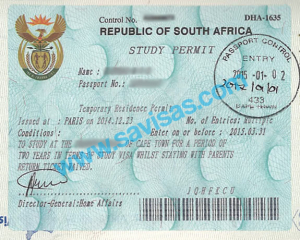 Will the South African study visa qualify me for permanent residency? No, a study visa never qualifies its holder for permanent residency. To qualify for permanent residency, the holder must first change status to a visa which can qualify for permanent residencies, such as a work visa or business visa. The holder of a study visa may apply for a change of visa status from within South Africa. It is not necessary for the applicant to leave the country and to submit a change of visa status or visa renewal application from abroad. Visa holders in many other categories must submit a change of status applications in their home countries. Study visa holders at tertiary education level are allowed to work part-time, but for no more than 20 hours per week. Study visa holders who work for more than the allowed hours contravene the terms of their study visa, may be declared undesirable and deported. Family members can accompany the primary study visa holder on accompanying family member visas. The study visa can be issued for lengthy periods of time, meaning that the holder does not need to renew the visa as regularly as with some other visa categories. The financial requirements for a study visa are much lower than for many other visa categories. There is no limit on a number of times a study visa can be renewed. What are the drawbacks to the South African study visa? Study visa holders never qualify for permanent residency. The limit on a number of hours study visa holders are allowed to work in the Republic means that many study visa holders struggle to maintain their financial independence. Study visas have in the past been abused by applicants who do not qualify for any other visa type. Accordingly, the Department of Home Affairs assesses study visa applications strictly. Each time the study visa holder changes schools a new study visa must be applied for. Study visa holders must have medical insurance for the duration of their study visa. The medical insurance must cover the candidate for the duration of studies in South Africa. What qualifies as a “learning institution”? Public Technical and Vocational Training (TVET) colleges (formerly known as Further Education and Training (FET) colleges), of which there are 50. Private Further Education and Training (FET) institutions (soon to be renamed private TVET colleges), of which there are around 462 registered institutions and 28 provisionally registered institutions. Learning institutions must strictly comply with the registration requirements of the Ministries of Basic and Higher Education. Institutions which fail to comply with compliance notices from the authorities are deregistered. Not all medical insurance schemes are recognised for purposes of a study visa. For a list of registered South African Medical Schemes which are recognised by the Department of Home Affairs, click here.